The Houston Astros are a Major League Baseball team located in Houston, Texas. They are a member of the of the National League. Since 2000, they have played their home games at Minute Maid Park, formerly known as Enron Field. The Coca-Cola Company-owned, Houston-based fruit juice manufacturer Minute Maid, after whom the Astros’ stadium is named, holds a minority stake in the team. The Astros were established as the Houston Colt .45s in 1962. They changed to their current name three years later, when they moved into the iconic Astrodome, the world’s first domed sports stadium. The name references Houston’s role as the center of the U.S. astronaut program. The Astros are the oldest MLB franchise to have never won the World Series while remaining in the same city over their history. After heart-breaking playoff losses in 1980, 1981, and 1986, and more playoff appearances in the late 1990s and early 2000s, the Astros finally appeared in their first and (to date) only World Series, in 2005 against the Chicago White Sox. 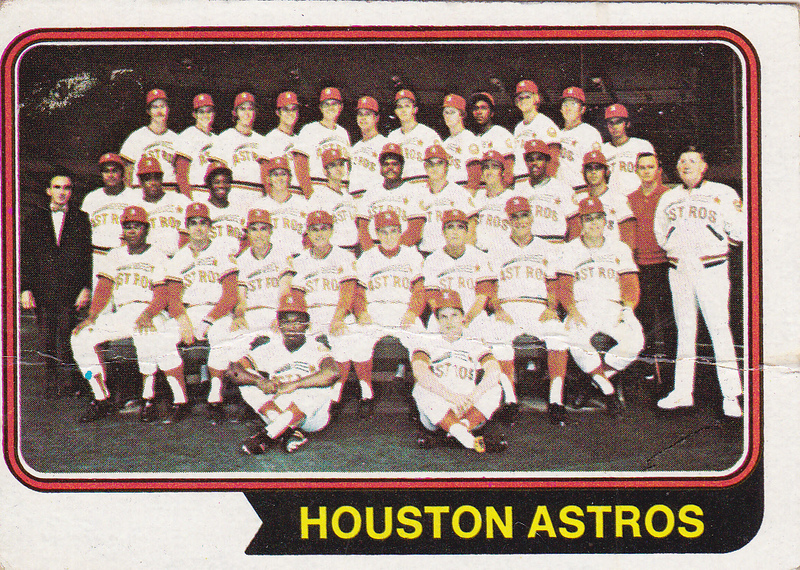 Posted in 1974, 1974 Team Photo, 1974 Topps, Astros, Houston Astros. Bookmark the permalink. 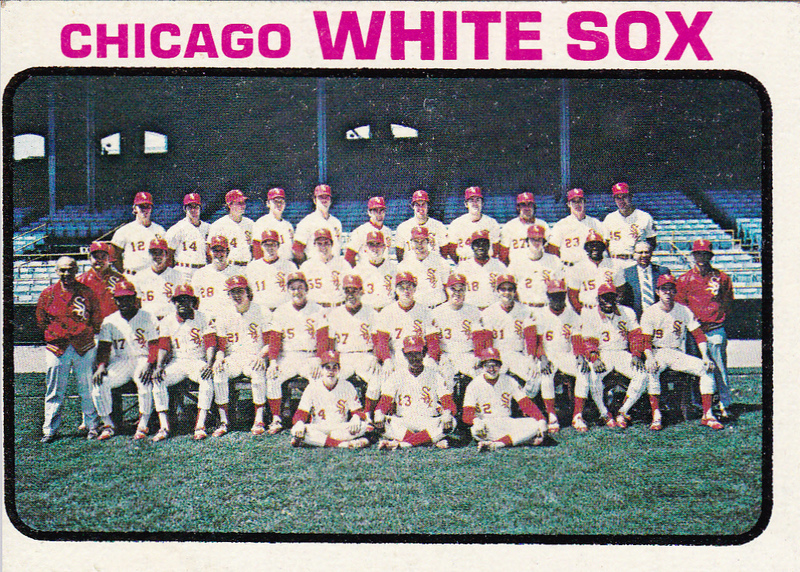 Posted in 1973, 1973 Team Photo, 1973 Topps, Chicago White Sox, White Sox. Bookmark the permalink. The Minnesota Twinsare a professional baseball team based in Minneapolis, Minnesota. They play in the Central Division of Major League Baseball’s American League. The team is named after the Twin Cities area of Minneapolis and St. Paul. 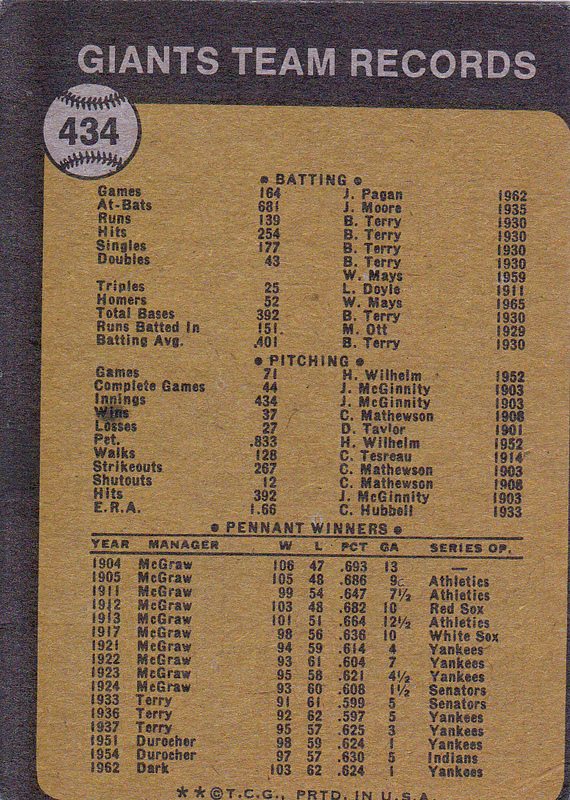 They played in Metropolitan Stadium from 1961 to 1981 and the Hubert H. Humphrey Metrodome from 1982 to 2009. They played their inaugural game at the newly completed Target Field on April 12, 2010. The team was founded in Kansas City in 1894 as a Western League team and would move to Washington, D.C., in 1901 as one of the eight original teams of the American League, named the Washington Senators or Washington Nationals. Although the Washington team endured long bouts of mediocrity (immortalized in the Broadway musical Damn Yankees), they had a period of prolonged success in the 1920s and 1930s, led by Hall-of-Famers Bucky Harris, Goose Goslin, Sam Rice, Joe Cronin, and above all Walter Johnson. Manager Clark Griffith joined the team in 1912 and became the team’s owner in 1920. The franchise remained under Griffith family ownership until 1984. In 1960, Major League Baseball granted the city of Minneapolis an expansion team. Washington owner Calvin Griffith, Clark’s nephew and adopted son, requested that he be allowed to move his team to Minneapolis and instead give Washington the expansion team. Upon league approval, the team moved to Minnesota after the 1960 season, setting up shop in Metropolitan Stadium, while Washington fielded a brand new “Washington Senators” (which later became the Texas Rangers prior to the 1972 season). Success came quickly to the team in Minnesota. Sluggers Harmon Killebrew and Bob Allison, who had already been stars in Washington, were joined by Tony Oliva and Zoilo Versalles, and later second baseman Rod Carew and pitchers Jim Kaat and Jim Perry, winning the American League pennant in 1965. A second wave of success came in the late 1980s and early 1990s, led by Kent Hrbek, Bert Blyleven, Frank Viola, and Kirby Puckett, winning the franchise’s second and third World Series (and first in Minnesota). 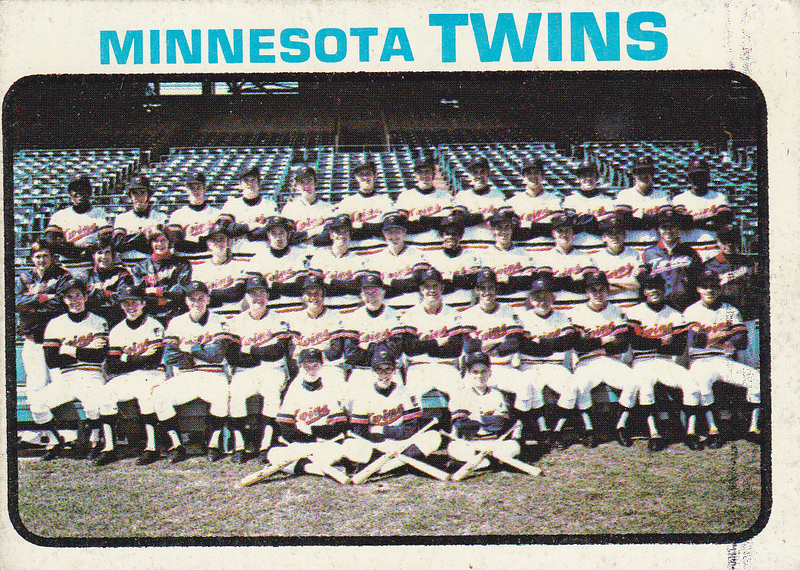 Posted in 1973, 1973 Team Photo, 1973 Topps, Minnesota Twins, Twins. Bookmark the permalink. The Philadelphia Phillies are a Major League Baseball team. 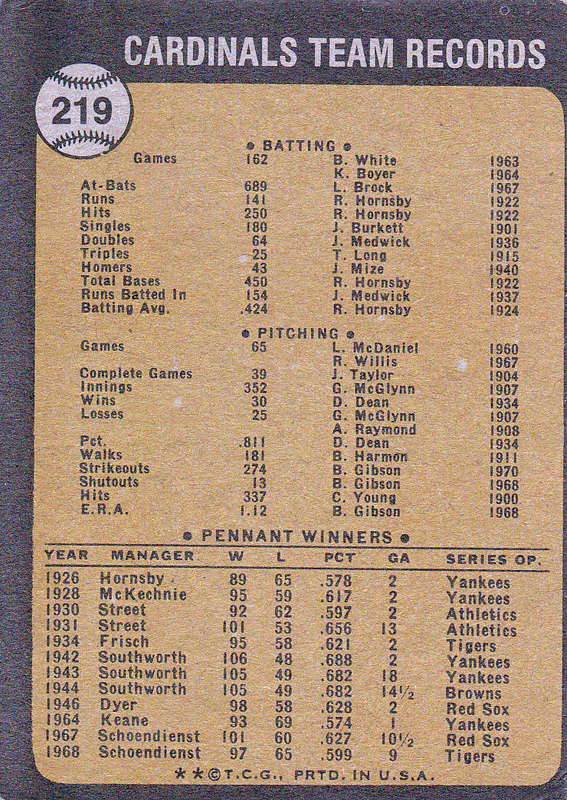 They are the oldest continuous, one-name, one-city franchise in all of professional American sports, dating to 1883. The Phillies are a member of the Eastern Division of Major League Baseball’s National League. Since 2004, the team’s home has been Citizens Bank Park in the South Philadelphia section of the city. The Phillies have won two World Series championships (against Kansas City in 1980 and Tampa Bay in 2008) and seven National League pennants, the first of which came in 1915. The franchise has also experienced long periods of struggle. The age of the team and its history of adversity has earned it the dubious distinction of having lost the most games of any team in the history of American professional sports. In light of the collectively poor performance over the years, the Phillies have performed much better in recent seasons, winning their division five times in a row since 2007. The franchise was founded in Philadelphia in 1883, replacing the team from Worcester, Massachusetts. The team has played at several stadiums in the city, beginning with Recreation Park and continuing at Baker Bowl; Shibe Park, which was later renamed Connie Mack Stadium in honor of the longtime Philadelphia Athletics manager; Veterans Stadium; and now Citizens Bank Park. The team’s spring training facilities are located in Clearwater, Florida, where its Class-A minor league affiliate Clearwater Threshers play at Bright House Field. 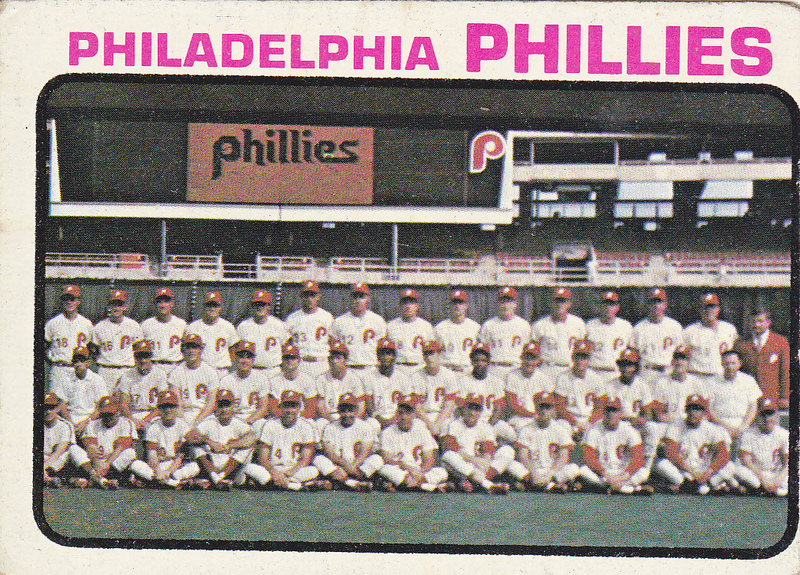 Posted in 1973, 1973 Team Photo, 1973 Topps, Philadelphia Phillies, Phillies. Bookmark the permalink. The Cleveland Indians are a professional baseball team based in Cleveland, Ohio. They are in the Central Division of Major League Baseball’s American League. Since 1994, they have played in Progressive Field. The team’s spring training facility is in Goodyear, Arizona. Since their establishment as a Major League franchise in 1901, the Indians have won two World Series championships, in 1920 and 1948. The “Indians” name originates from a request by the club owner to decide on a new name, following the 1914 season. 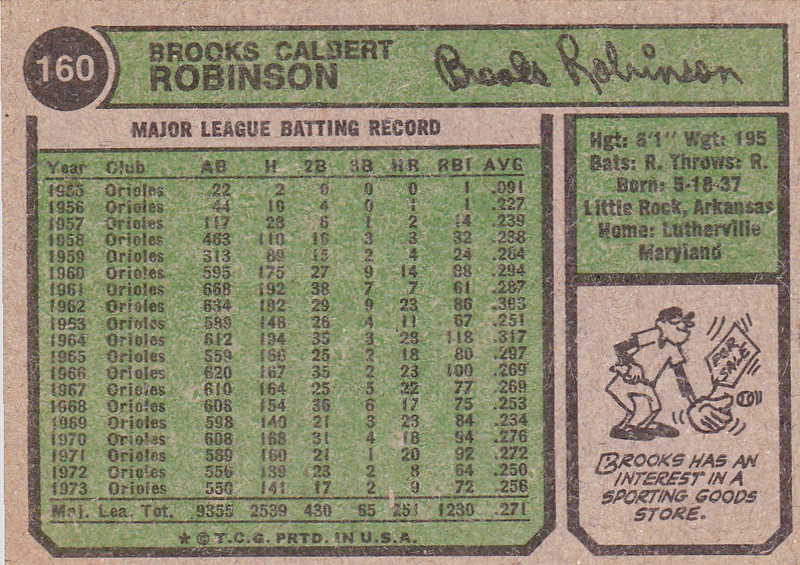 In reference to the Boston Braves (now the Atlanta Braves), the media chose “the Indians”. Common nicknames for the Indians include the “Tribe” and the “Wahoos,” the latter being a reference to their logo, Chief Wahoo; The mascot is called Slider. The Cleveland team originated in 1900 as the Lake Shores, when the American League (AL) was officially a minor league. One of the AL’s eight charter franchises, the major league incarnation of the club was founded in Cleveland in 1901. Originally called the Cleveland Bluebirds, the team played in League Park until moving permanently to Cleveland Municipal Stadium in 1946. 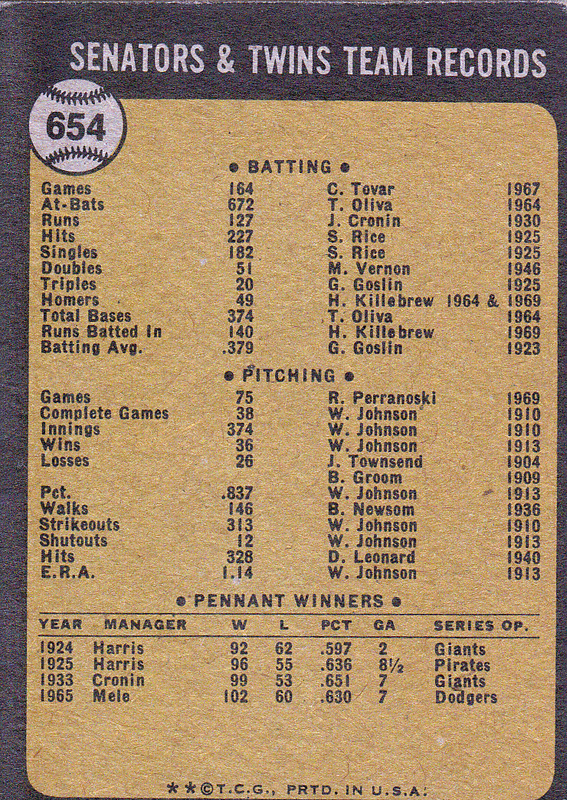 At the end of the 2010 season, they had a regular season franchise record of 8,691–8,367 (.509). The Indians have won seven AL Central titles, the most in the division. 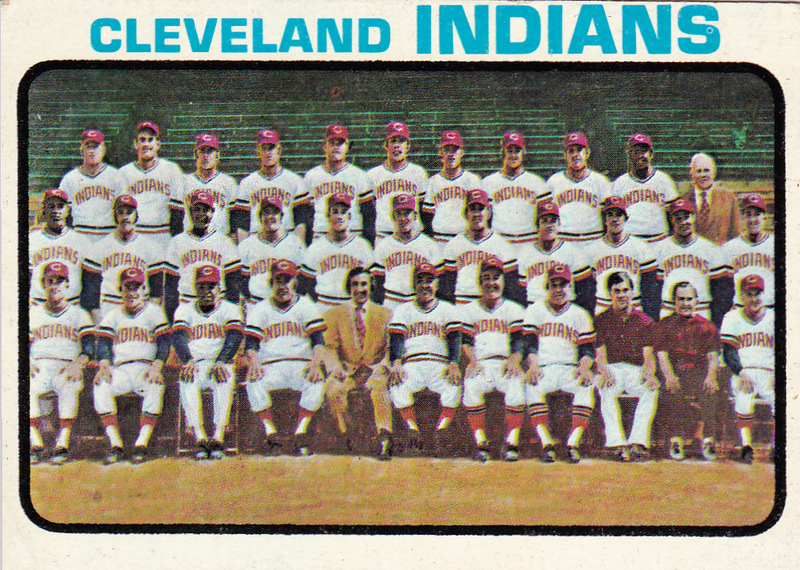 Posted in 1973, 1973 Team Photo, 1973 Topps, Cleveland Indians, Indians. Bookmark the permalink. 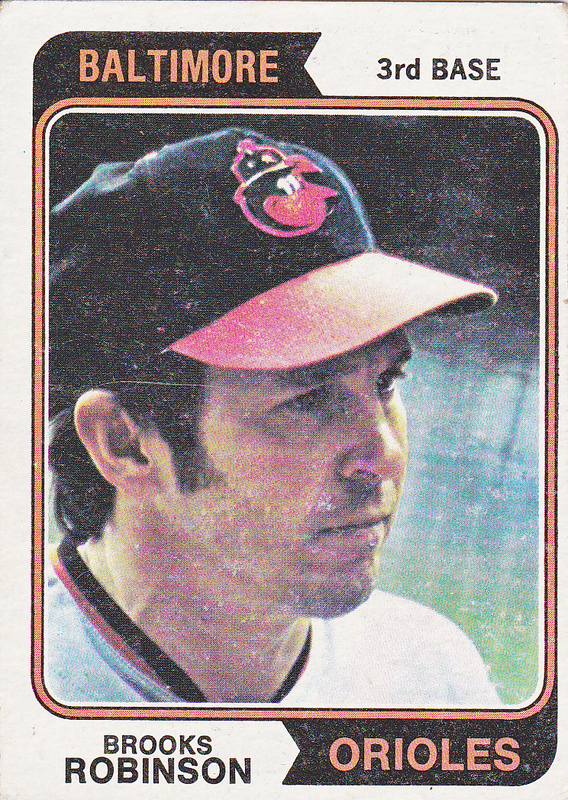 Posted in 1974, 1974 Topps, 3rd Base, Baltimore Orioles, Orioles. Bookmark the permalink. The San Francisco Giants are a Major League Baseball team based in San Francisco, California, playing in the National League West Division. As one of the oldest baseball teams, they have won the most games of any team in the history of American baseball, and any North American professional sports team. 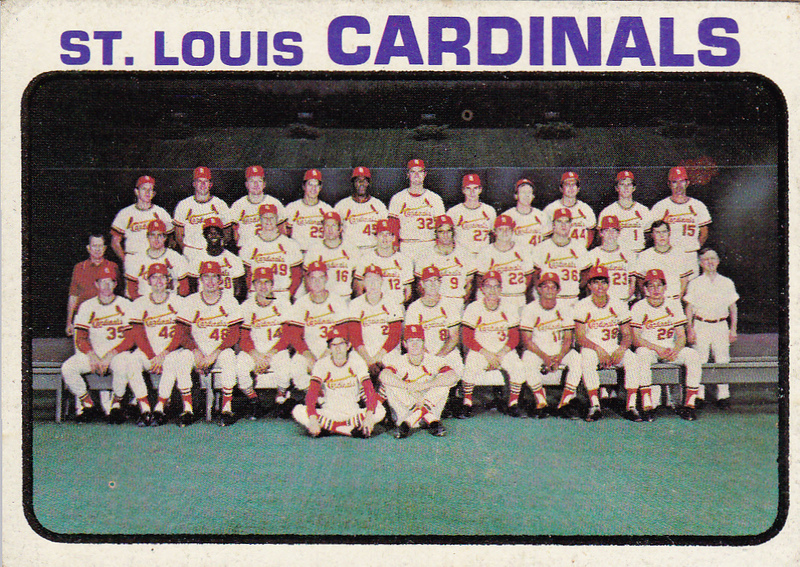 They have won 21 National League pennants and appeared in 18 World Series competitions – both records in the National League (tied for NL pennants with the Los Angeles Dodgers and for World Series appearances with the Los Angeles Dodgers and the St. Louis Cardinals). The Giants 6 World Series Championships are also tied for second in the National League with the Dodgers (the St. Louis Cardinals have won 10). The Giants have played in the World Series an NL record 18 times, but boycotted the event in 1904. 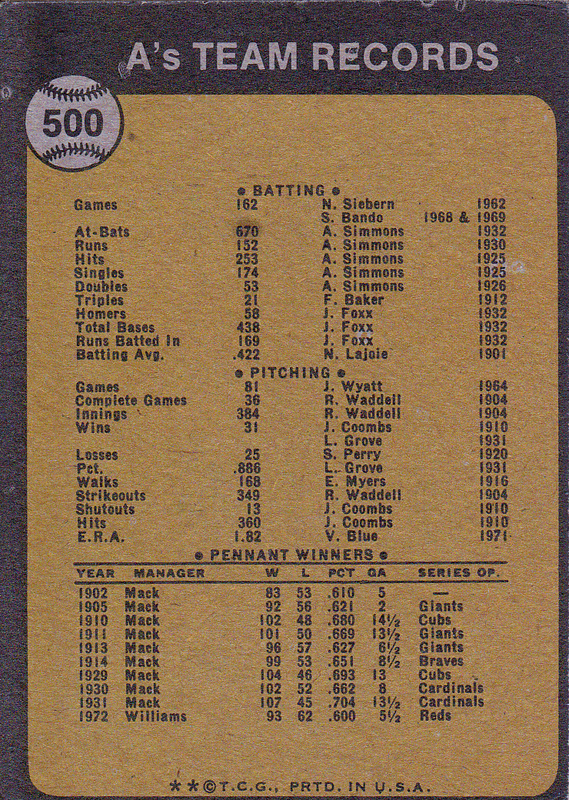 With their history, the Giants have the most Hall of Fame players in all of professional baseball. The Giants played at the Polo Grounds in Manhattan, New York, until the close of the 1957 season, after which they moved west to California to become the San Francisco Giants. As the New York Giants, they won 14 pennants and 5 World Championships, from the era of John McGraw and Christy Mathewson to that of Bobby Thomson and Willie Mays. The Giants have won four pennants and the 2010 World Series since arriving in San Francisco. 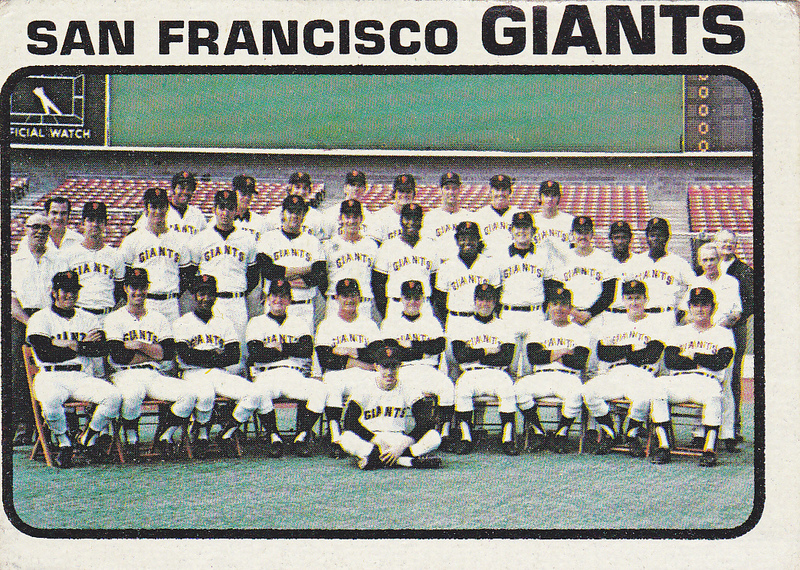 Posted in 1973, 1973 Team Photo, 1973 Topps, Giants, San Francisco Giants. Bookmark the permalink. The Montreal Exposwere a Major League Baseball team located in Montreal, Quebec from 1969 through 2004, holding the first MLB franchise awarded outside the United States. After the 2004 season, MLB moved the Expos to Washington, D.C. and renamed them the Nationals. Named after the Expo 67 World’s Fair, the Expos started play at Jarry Park Stadium under manager Gene Mauch. The team’s initial majority owner was Charles Bronfman, a major shareholder in Seagram. Following the 1976 Summer Olympics, starting in 1977 the team’s home venue was Montreal’s Olympic Stadium. 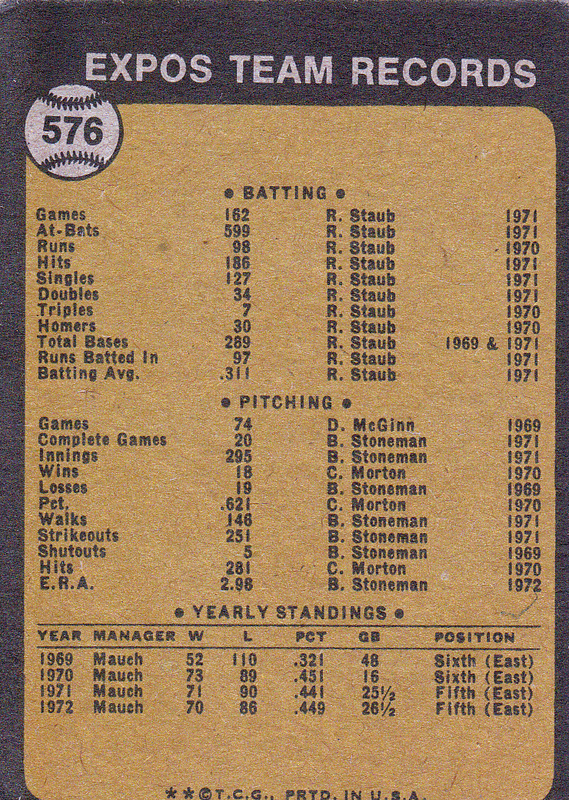 After a decade of losing seasons, the team won a franchise-high 95 games in 1979, finishing second in the National League East. The Expos began the 1980s with a core group of young players, including catcher Gary Carter, outfielders Tim Raines and Andre Dawson, third baseman Tim Wallach, and pitchers Steve Rogers and Bill Gullickson. 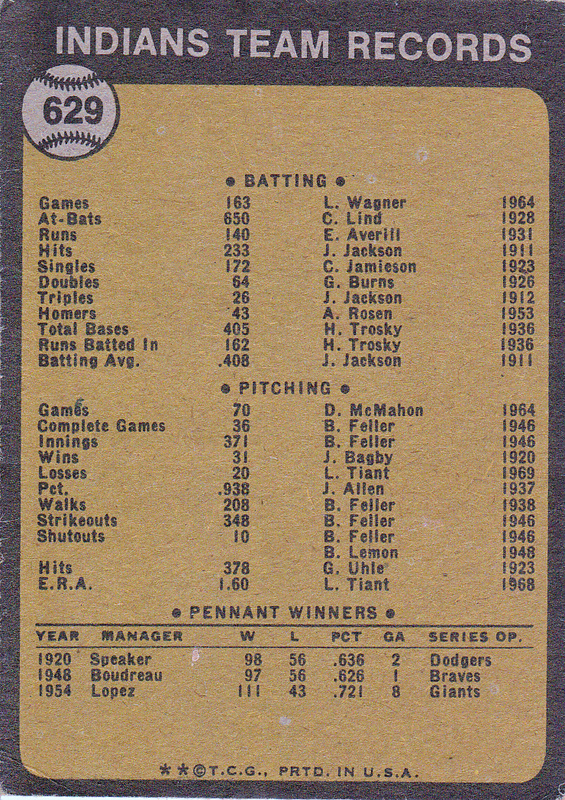 The team won its only division championship in the strike-shortened split season of 1981, ending its season with a 3 games to 2 loss to the Los Angeles Dodgers in the National League Championship Series. On September 29, 2004, the date of Montreal’s last home game of the season, MLB announced that the Montreal franchise would move to Washington, D.C. for the 2005 season. The Expos played their final game on October 3, 2004 at Shea Stadium, losing by a score of 8–1 against the New York Mets, the same opponent that the Expos first faced at its start, 35 years earlier. The Washington team was named the Washington Nationals, and retained all the Expos’ records, player contracts, and minor league affiliates, as well as their spring training complex in Viera, Florida. 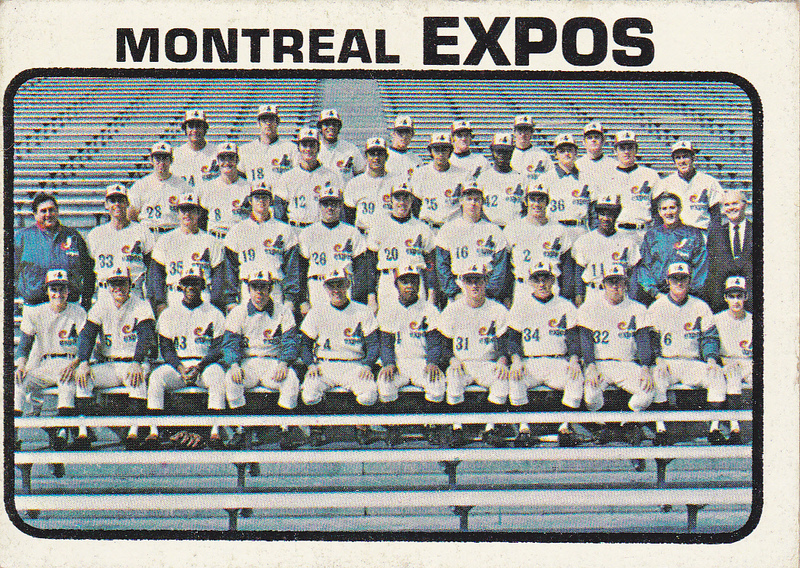 Posted in 1973 Team Photo, 1973 Topps, Expos, Montreal Expos. Bookmark the permalink. The Oakland A’s are a Major League Baseball team based in Oakland, California. The Athletics are a member of the Western Division of Major League Baseball’s American League. From 1968 to the present, the Athletics have played in the O.co Coliseum. One of the American League’s eight charter franchises, the club was founded in Philadelphia, Pennsylvania, in 1901 as the Philadelphia Athletics. 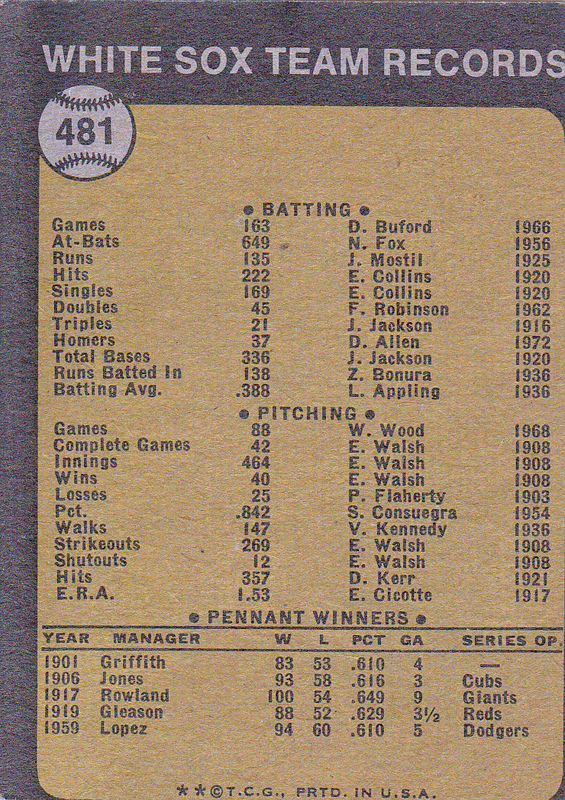 The team had some prominent success in Philadelphia, winning three of four World Series from 1910 to 1914 (the “First Dynasty”) and two in a row in 1929 and 1930 (the “Second Dynasty”). The team’s owner and manager for its first 50 years was Connie Mack, and its Hall-of-Fame players included Chief Bender, Frank “Home Run” Baker, Jimmie Foxx and Lefty Grove. 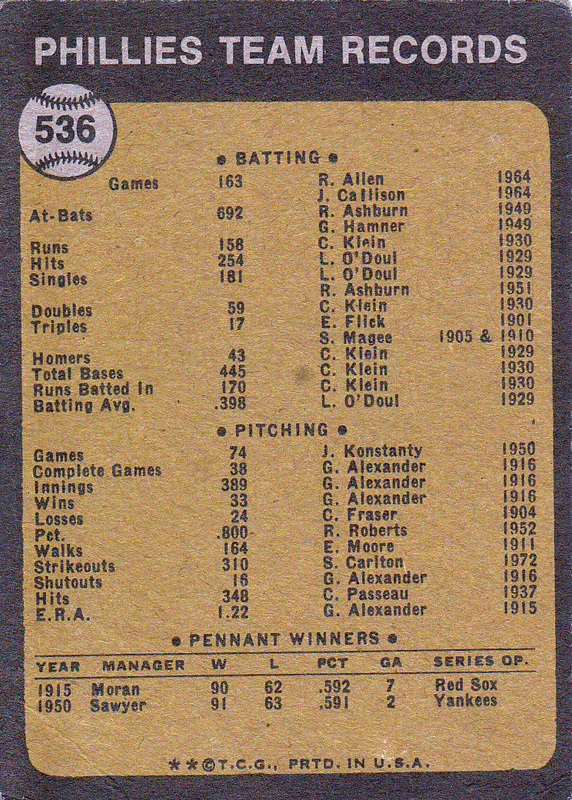 After two decades of decline, however, the team left Philadelphia for Kansas City in 1955 and became the Kansas City Athletics. 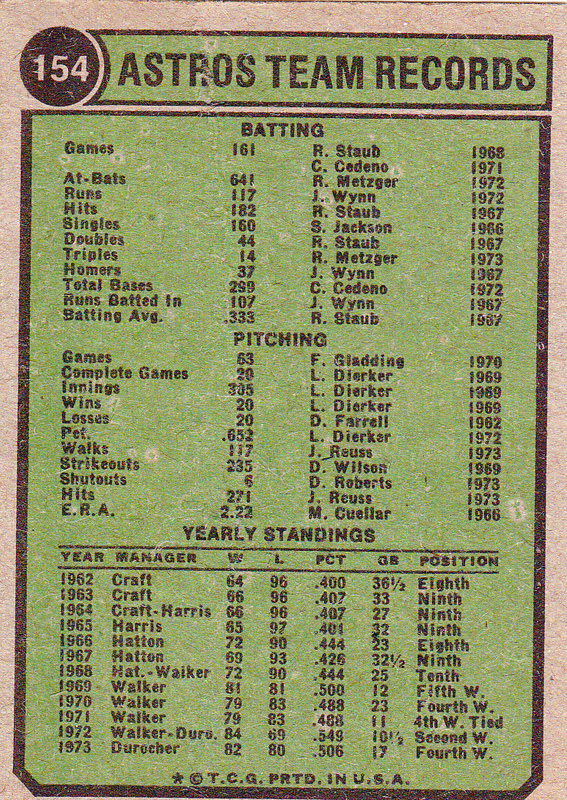 After 13 mostly uneventful seasons in the Midwest, the team moved to Oakland in 1968. There a “Third Dynasty” soon emerged, with three World Championships in a row from 1972 to 1974 led by players including Catfish Hunter and Reggie Jackson, and colorful owner Charlie O. Finley. Finally, a “Fourth Dynasty” won three consecutive pennants and the 1989 World Series behind Mark McGwire, Jose Canseco and Dennis Eckersley. In more recent years, the A’s have often been playoff contenders but have not returned to the World Series since 1990. In 2002, the A’s won 20 games in a row which broke an AL record, as shown in the film Moneyball. 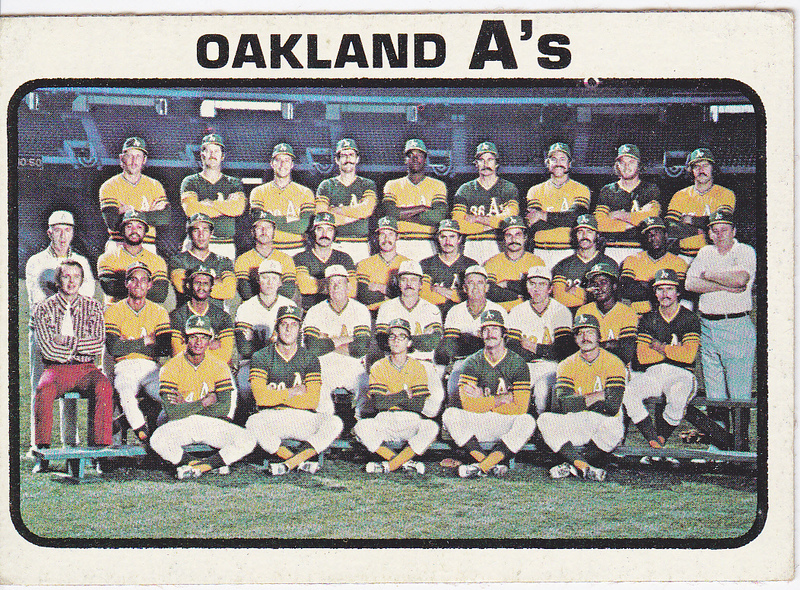 Posted in 1973, 1973 Team Photo, 1973 Topps, A's, Oakland A's. Bookmark the permalink.